Ford Motor Company sells its first car, a Model A to Ernst Pfenning of Chicago Illinois. Unlike the later Model T, you could get the Model A in any color you liked, as long as it was red. The original Ford Model A is the first car produced by Ford Motor Company, beginning production in 1903. Ernst Pfenning of Chicago, Illinois became the first owner of a Model A on July 23, 1903. 1,750 cars were made from 1903 through 1904. 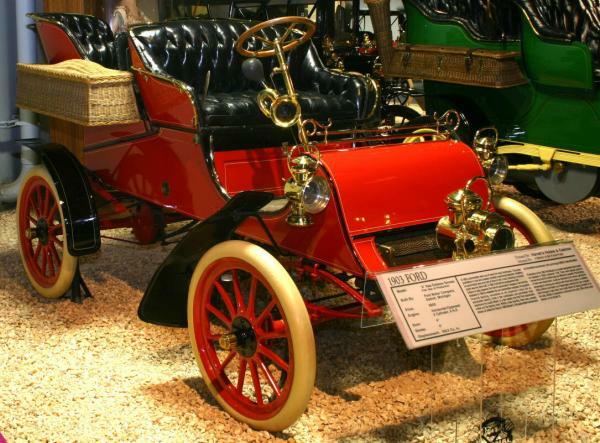 The Model A was replaced by the Ford Model C during 1904 with some sales overlap. The car came as a two-seater runabout or four-seater tonneau model with an option to add a top. The horizontal-mounted flat-2, situated at the amidships of the car, produced 8 hp (6 kW). A planetary transmission was fitted with two forward speeds and reverse, a Ford signature later seen on the Ford Model T. The car weighed 1,240 lb (562 kg) and could reach a top speed of 28 mph (45 km/h). It had a 72 inch (1.8 m) wheelbase and sold for a base price of US$750 (equivalent to $18300 today). Options included a rear tonneau with two seats and a rear door for $100, a rubber roof for $30 or a leather roof for $50.